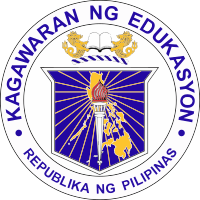 The Department of Education (abbreviated as DepEd; Filipino: Kagawaran ng Edukasyon) is the executive department of the Philippine government responsible for ensuring access to, promoting equity in, and improving the quality of basic education. It is the main agency tasked to manage and govern the Philippine system of basic education. It is the chief formulator of Philippine education policy and responsible for the Philippine primary and secondary school systems. It has its headquarters at the DepEd Complex in Meralco Avenue, Pasig City. The department is currently led by the Secretary of Education, nominated by the President of the Philippines and confirmed by the Commission on Appointments. The Secretary is a member of the Cabinet. The current Secretary of Education is Leonor Briones. Presently, its mission is to provide quality basic education that is equitably accessible to all and lay the foundation for lifelong learning and service for the common good. It has changed its vision statement, removing a phrase that some groups deem to be "too sectarian" for a government institution. During the early Spanish period, education in the Philippines was religion-oriented and was primarily for the elite, especially in the first years of Spanish colonization. Access to education by Filipinos was later liberalized through the enactment of the Educational Decree of 1863, which provided for the establishment of at least one primary school for boys and girls in each town under the responsibility of the municipal government, and the establishment of a normal school for male teachers under the supervision of the Jesuits. Primary instruction was secularized and free, and the teaching of Spanish was compulsory. It was also through this decree that the 'Superior Commission of Primary Instruction' was established, the seminal agency of the Department of Education. The defeat of Spain by United States forces in 1898 paved the way for Aguinaldo's Republic under a Revolutionary Government. The schools maintained by Spain for more than three centuries were closed temporarily but were reopened on August 29, 1898 by the Secretary of the Interior. A system of free and compulsory elementary education was established by the Malolos Constitution, under Article 23. However, this first sovereign education system was interrupted in 1899 with the start of the Philippine–American War, and was finally dismantled. A secularized and free public school system during the first decade of American rule was established upon the recommendation of the Schurman Commission in 1900. Free primary instruction that trained the people for the duties of citizenship was enforced by the Taft Commission as per instructions of US President William McKinley. Chaplains and non-commissioned officers were assigned to teach using English as the medium of instruction. A highly centralized public school system was instituted in January 1901 by the Taft Commission, by virtue of Act No. 74. This act also established the Department of Public Instruction, headed by a General Superintendent. The implementation of this Act created a heavy shortage of teachers so the Philippine Commission authorized the Superintendent of Public Instruction to brin 500 teachers from the United States to the Philippines. They would later be popularly known as the Thomasites. In 1908, the Philippine Legislature approved Act No. 1870, creating the University of the Philippines. The Organic Act of 1916 reorganized the Department of Public Instruction, mandating that it be headed by a Secretary. This act also mandated the Filpinization of department secretaries, except that of the Secretary of Public Instruction. During World War II, the department was reorganized once again through the Japanese's Military Order No. 2 in February 1942, splitting the department into the Ministry of Education and the Ministry of Health, Labor and Public Instruction. Under the Japanese, the teaching of Tagalog, Philippine history, and character education was given priority. Love for work and the dignity of labor were also emphasized. In October 1944, months after Pres. Manuel L. Quezon's death, the department was renamed as the Department of Public Instruction and Information, with Carlos P. Romulo at the helm. Upon the return and resumption of the Commonwealth Government in February 1945, its name was changed to the Department of Instruction. In 1947, by virtue of Executive Order No. 94 by Pres. Manuel Roxas, the department was reorganized to the Department of Education. During this period, the regulation and supervision of public and private schools belonged to the Bureau of Public and Private Schools. Upon the start of Martial Law in September 1972, it became the Department of Education and Culture and subsequently reorganized into the Ministry of Education and Culture in June 1978 by virtue of Presidential Decree No. 1397, due to the shift to a parliamentary system of government. Thirteen regional offices were created and major organizational changes were implemented in the educational system. The Education Act of 1982 created the Ministry of Education, Culture and Sports, which became the Department of Education, Culture and Sports (DECS) in 1987 via Executive Order No. 117 by President Corazon C. Aquino. The structure of DECS as embodied in EO 117 has practically remained unchanged until 1994, when the Commission on Higher Education (CHED) was established, and in August 25, 1994, when the Technical Education and Skills Development Authority (TESDA) was established to supervise tertiary degree programs and non-degree technical-vocational programs, respectively. The trifocal education system refocused the department's mandate to basic education which covers elementary, secondary and non-formal education, including culture and sports. CHED is responsible for tertiary education, while TESDA now administers the post-secondary, middle-level manpower training and development. In August 2001, the Governance of Basic Education Act was passed, renaming the DECS to the Department of Education (DepEd) and redefining the role of field offices, which include regional offices, division offices, district offices, and schools. The Act removed the administration of cultural and sports activities from the department. The National Historical Institute, Records Management and Archives Office, and the National Library are now administratively attached to the National Commission for Culture and the Arts (NCCA). All previous functions, programs, and activities related to sports competition were transferred to the Philippine Sports Commission (PSC). In addition, the Bureau of Physical Education and School Sports was abolished. A director is assigned to each of the 17 regions of the Philippines; the Autonomous Region in Muslim Mindanao is governed by a regional secretary. A division superintendent is assigned to each of the school divisions defined by the department. The Commission on Higher Education (CHED) is now attached to the Office of the President, while the Technical Education and Skills Development Authority (TESDA) is now attached to the Department of Labor and Employment. ^ a b "Republic Act No. 9155". Chan Robles Virtual Law Library. Retrieved 1 November 2012. ^ "DepEd changes vision statement, removes 'God-loving'". ABS-CBNnews.com. 2014-08-23. ^ a b c "Department of Education of the Philippines - DepEd - History". Archived from the original on 22 July 2010. Retrieved 1 November 2012. ^ "Executive Order No. 94, s. 1947". Official Gazette of the Republic of the Philippines. Retrieved 1 November 2012. ^ "Presidential Decree No. 1397". Chan Robles Virtual Law Library. Retrieved 1 November 2012. ^ "Batas Pambansa Blg. 232". The LAWPHiL Project. Retrieved 1 November 2012. ^ "Executive Order No. 117". The LAWPHiL Project. Retrieved 1 November 2012. ^ "Directory of Officials - Department of Education". Retrieved 14 January 2017.